More info:This is a fully supported e-bike ride and with accommodation with most meals, ebike hire charges, guide,support vehicle and luggage transfers. This tour starts on any day of the week and runs throughout the year. This tour can also be tailor-made. As a responsible tour operator, we realise the importance of tourism on the environment and local communities. We undertake our responsibilities in the way we conduct our business. That all our adventure tours are based in most part on the outdoors showcasing Kerala’s rich tapestry of forests and wildlife is a pointer to our philosophy in conservation. Our activities are based in accommodations that minimally impact the environment. One of the best examples is the Hornbill camp set up to experience nature trails into the lowland forests especially the great endemism that is present here with special emphasis on its avifauna. Its minimal environmental impact is showcased in the minimalist design of the canvass tented accommodation, use of solar lamps, use of organic farming using no chemical fertilisers and the purified water from natural springs that are here. There is also a homestay which we use on this tour which is totally an organic farm and boasts of an evergreen forest patch patiently planted through a quarter century of hard work. There is now abundant bird life and a low impact lifestyle for those who come here as tourists who marvel at this modern day lifestyle without forgetting the traditional practices of the past in preserving an environment. The other family owned resorts on this route also boast of being environmentally friendly and recognised for its good environmental practices like efficient usage of waste water in the farm as well as their gardens. The route of this ride itself follows rural roads where the local communities thrive with their spice gardens and sustainable farming methods. Thus we believe that this ride in the true spirit of responsible travel respects and benefit local people, their cultures, economy and the environment. Our focus during this tour is to allow travellers to immerse themselves with the local communities. We take extra care to take our guests to where local communities make authentic handicrafts using environmentally friendly way – for example, the small baskets and handicrafts made of locally harvested reeds which are painstakingly harvested by the local tribal community members. Sale of such artefacts helps both the tribal and local communities. The accommodation is specially chosen to ensure that they are managed by members of local communities. For example at the Hornbill camp at Thattekkad, all members of the staff are from the local village, the naturalists are self taught with excellent local knowledge of their environment, the materials for the food that is served is sourced from local village farms which ensures that they make a decent living and even the jeeps and tuk tuks used for trips from the camp are owned by members of the village. 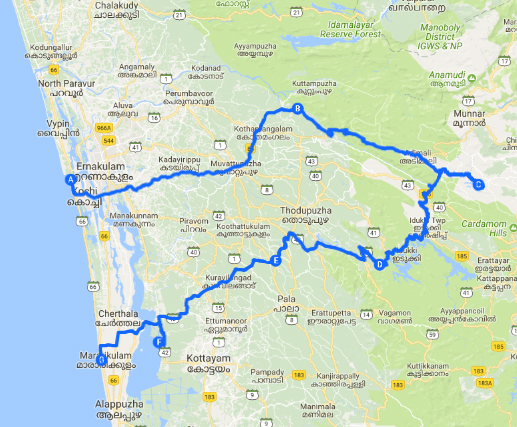 As we move on to the mountains of the Western Ghats, we ensure that the refreshments en route are from local stalls and giving the travellers a ringside views and news of life in isolated mountain communities. A special feature of the tour is that you get time to spend with a local family in their home and join them as they go about their work in the farm or interact with the local people. The highlight would be the cooking classes with the hostess, learning the secrets of local cuisine. The homestay supports livelihood of approximately a dozen families in the community through tourism. We also take care to use only locally hired drivers many of them owning their own vehicles to earn tourism income which helps them pay for their cars. This is an integral part of the tourism initiatives prevalent in Kerala. The most memorable was bike riding through rural and more remote areas. The e-bike tour is quite new for the travel company but it worked really well. We are 59 and 65 respectively and given the heat and, in particular, the state of many of the back roads, were very happy to have the extra electrical assistance. While the bikes on a good road with minimal traffic could go up to 24km/hr, we mostly went not more than about 8km/hr as the roads were in parts very rough. We found 4-5 hours/ day very manageable and a good way to see a lot, and build in a little morning tea stop in a local place - hot sweet milk tea and samosas mainly! That left the rest of the day to sight see or sit with a good book in lovely home stay gardens, feeling satisfied we had had a good physical work out. Yes, we always ate in local non-tourist places and mostly had home stays. The home stays were with better off families, however. Bike riding is relatively low impact though we also had a van that followed around us so no saving environmental impact there. Excellent - a fantastic and enjoyable 9 day break that gave us a perfect combination of exploring, seeing and learning something new, staying out of cities, meeting some local people and gaining quite a bit of fitness without the pressures of arranging. Our guide and our driver were both excellent and easy, relaxed company which made popping into small dingy looking tea or lunch places really comfortable and fun. They were also very mindful of looking after us well and in particular keeping us to smaller, quieter backroads, which meant we from time to time would load the bikes in the van to avoid busy scarier roads for a few kms at a time. We varied our planned tour to allow a day trip to Munnar to see the tea plantations which had not been planned but was a real highlight - all was very easy to make the change. A great holiday overall and would highly recommend if you are active and curious and enjoy staying away from big cities and tourists.